Great sketch that looks like it'll gut ya first chance it gets! Well done Chris. Hard...core! I love the combination of the ultra-feral underbite coupled with the slouched-over lassitude that he conveys. Kinda like, "I'll gut ya, but only if I don't have to get off of the couch to do it." Clever body language and characterization, Chris! FYI - I think that issue was Wolverine #10. Weird, the first time I remember seeing Sabertooth on a cover, it was on Iron Fist #14, where he is fighting Iron Fist in the snow as well. I love this! The snow is captured perfectly. 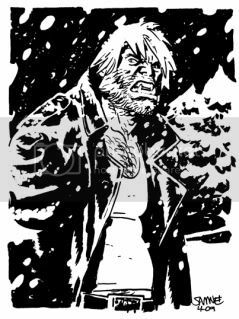 THAT is how Sabretooth should be drawn! Well done!